All grants in the form of a voucher can be redeemed at a retail nursery which is a member of Nursery and Garden Industry of Victoria (NGIV) and must be used before the expiry date. A list of retailers will be provided with the voucher. Produce (vegetable, fruit, herb & bush tucker) gardens in which students are involved in planning, growing, preparing, consuming or serving the products in their school and/or wider community. A garden designed to support the ecosystems of which they are a part and save the plants, animals and micro-organisms. A garden that stimulates the use of the five senses. May include; scented and edible plants, water features designed to make sound and play over the hands, textured plants, use of colour, etc. A larger scale project to improve a school yard’s green environment and student’s connection with nature. Provides funds for schools to tidy/repair an existing garden/area that needs some work to bring it back to order. A compost mix for vegetables gardens (4-6 cubic metres). AGS to discuss individual requirements with the winning school. 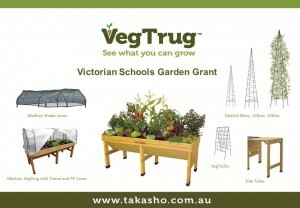 One medium VegTrug with frame, shade covers and side table, and four different size trellis frames. Due to differing school types and sizes, there are three categories for entry into the Victorian Schools Garden Awards. You will be required to select your school category during the online entry process.